Per email received from Jasmani Francis, supporters of Ninth Subcircuit candidate William J. Luby ("A" vacancy) have organized two events in early January. Interested persons are invited to stop by 827 Monticello Place in Evanston on Sunday, January 3, between Noon and 6:00pm to meet the candidate and pick up lawn signs supporting Luby's candidacy. On Saturday, January 9 the Luby campaign will host another meet-and-greet at the Evanston American Legion Hall, 1030 Central Street, from 6:00 to 10:00pm. If you visit the corresponding event page on the Luby campaign website, you will see the word "fundraiser" used. However, while I do not expect that persons brandishing checks will be turned away, I am informed that there will not be any ticket sales. There will be a cash bar. And more lawn signs. There will also be a live band playing, the Billy Blues Band. For additional information about either gathering, send an email to 4luby@luby2010.com or call Nicole at 312-332-5161. You may have heard or read that several Chicago Park District sites will chip and mulch Christmas trees in the coming couple of weeks... but neither this AP story on the WGN-TV website nor this article on the Chicago Sun-Times website tells you exactly where you can take your tree. Forestry Site, 900 E. 103rd St.
Garfield Park,100 N. Central Park Ave.
Humboldt Park Boathouse,1369 N. Sacramento Ave.
Kennedy Park,11320 S. Western Ave.
Margate Park, 4921 N. Marine Dr.
Mt. Greenwood Park, 3721 W. 111th St.
North Park Village, 5801 N. Pulaski Rd. Warren Park, 6601 N. Western Ave.
Wentworth Park, 5625 S. Mobile Ave.
Chicago residents will be able to pick up free mulch at these locations between January 8 and January 17. Related: Holiday light recycling available. Found on the Internet, the blog Political Tracks -- a View from the Southside and, in particular, this November 24 post analyzing the 15th Subcircuit races at the south end of Cook County. I'm not adopting or agreeing with the analysis, but I thought it was interesting and worth calling attention to it... for what it's worth. The proprietor of the Political Tracks blog, Alan Cottrell, also has posted a 16 minute video of Judge John Griffin addressing a recent meeting of "Team Hope" (f/k/a Team Obama) at the Flossmoor Station Restaurant and Brewery. Judge Griffin's talk is on the various ways by which judges are selected in Cook County; you will be unsurprised to learn that the video contains a pitch for Griffin's candidacy (he's a candidate for the Phelan vacancy in the 15th Subcircuit). With Mr. Cottrell's permission, you can watch the interview now on page two of this blog. As for Team Hope, as the former name indicates, the group began from a core of south suburban Obama volunteers that decided to stay together and politically involved after last year's election. Cottrell writes that Team Hope's meetings are open to the public but that the group "does not make endorsements and encourages participation in the political process as participants see fit." Per email received, the campaign website of Mary S. Trew is up and running. That's a link to the website in the preceding sentence; a link has also been added to the Sidebar. 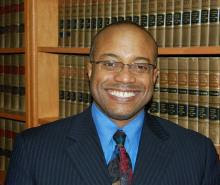 Trew is a candidate for the "A" vacancy in Cook County's Ninth Judicial Subcircuit. Per email received, 11th Subcircuit candidate Pamela McLean Meyerson is having two fundraisers in the next couple of weeks. The first of these is tomorrow night, December 30, at FitzGerald's, 6615 W. Roosevelt in Berwyn. 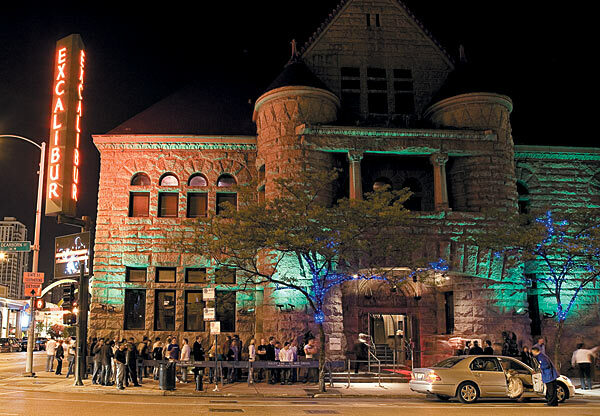 Billed as an "all-ages get-together," the event will run from 8:00pm to Midnight. Four bands are scheduled to play. Tickets are available at the door and the suggested donation is $25 for adults and $5 for students. There will be a cash bar available. For more information, see this page on the Meyerson campaign website. A second Meyerson fundraiser will be held downtown on Tuesday, January 19, from 5:30 to 7:30pm, at Lizzie McNeill's, 400 N. McClurg Court (at the river). Tickets for this event are scaled at $50 (the "Friend" level), $100 ("Supporter"), $250 ("Sponsor") or $500 ("Amicus"). For more information about this event, and to make reservations, go to this page on the Meyerson website. 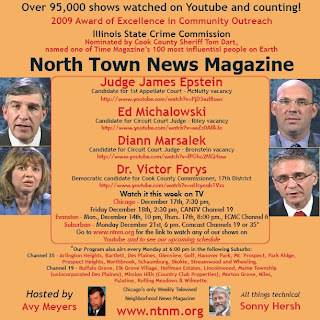 One of Avy Meyers' five guests on the next episode of North Town News Magazine is a Cook County judicial candidate. Judge Yehuda P. Lebovits, appointed by the Illinois Supreme Court to the Otaka vacancy in the 9th Judicial Subcircuit, will be interviewed on the program, which airs Thursday, New Year's Eve, on CAN-TV, Channel 19, in Chicago, at 7:30pm and again on Friday, New Year's Day, at 2:30pm. Evanston residents can watch on Cable Channel 6 on Thursday at 8:00pm. Other guests on the December 31/January 1 program are Cook County Circuit Court Clerk Dorothy Brown, Democratic candidate for Cook County Board President; Dr. Arie Friedman, a Republican candidate for Congress in the 10th District; Joel Pollak, a Republican candidate for Congress in the 9th District; and John Garrido, a Republican candidate for Cook County Board President. You can watch the Lebovits interview now on Page Two of the blog by clicking here. 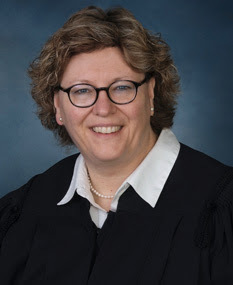 Found on the Internet, the campaign website of Judge Pamela Leeming, appointed by the Illinois Supreme Court to the countywide McCarthy vacancy and a candidate for the Riley vacancy in Cook County's 11th Judicial Subcircuit. That's a link to the site in the preceding sentence; a link has also been added to the Sidebar. Personal PAC is a bi-partisan political action committee dedicated to electing pro-choice candidates to state and local office in Illinois. Pro-choice forces are currently facing an unprecedented attack on reproductive rights. Anti-choice candidates and legislation, on both the state and national level, are threatening to dangerously restrict and deny access to safe and legal abortions. This renewed assault on reproductive and abortion rights must be reversed with an electoral strategy designed to defeat anti-choice politicians, and to elect and re-elect pro-choice officials dedicated to protecting a woman’s right to choose. Personal PAC’s determination and time-tested strategy for electing solidly pro-choice candidates in Illinois is needed now more than ever for the upcoming elections. The linked endorsement page indicates that additional endorsements may be forthcoming. A fundraiser is being planned for Bonnie Carol McGrath, a candidate for the countywide Hayes vacancy, on January 4, 2010, from 5:00 to 7:00pm at Petterino's, 150 N. Dearborn Street, just across from the Daley Center. Individual tickets are available for $100. "Friend" tickets are $500 while "Sponsor" tickets are available for $1,000. Ticket requests may be sent to The Friends of Bonnie Carol McGrath, 47 W. Polk Street, Suite 100-138, Chicago, Illinois 60605. Two of the five guests on this week's edition of North Town News Magazine are judicial candidates in Cook County. Abbey Fishman Romanek, a candidate for the Otaka vacancy in the 9th Judicial Subcircuit, and Judge Thomas V. Lyons, the sole remaining candidate for the countywide O'Malley vacancy. You can see either of these interviews right now on Page Two by clicking on the links in the preceding sentence. This edition of North Town News Magazine can be seen in its entirety Thursday, Christmas Eve, on CAN-TV, Channel 19, in Chicago, at 7:30pm and again on Friday, Christmas Day, at 2:30pm. 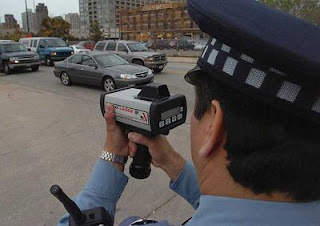 Evanston residents can watch on Cable Channel 6 on Thursday at 8:00pm. Other guests on the program are Toni Preckwinkle, candidate for President of the Cook County Board; Joseph Berrios, candidate for Cook County Assessor; and Dean Maragos, candidate for New Trier Township Democratic Committeeman. 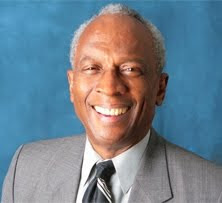 I've come across an interview by Cook County Circuit Court Judge (and Appellate Court candidate) Pamela Hill Veal of First Subcircuit candidate Thaddeus L. Wilson (Coleman vacancy) and countywide candidates William H. Hooks (Berland vacancy) and Marvin W. Gray (Riley vacancy) on something called the Probation Challenge Connection Network. A mission statement above the video screen advises, "PCC NET TV's goal is to educate and brings about an Awareness - Awareness brings on the ability to think. Thusly,a person can prayerfully make rational decisions." I had not heard of PCC NET until I came across this video. If it has a cable outlet of any kind, I've not discovered it. Anyway, you can watch the entire video on Page Two. Elliot Powell withdrew Tuesday as a candidate for the "A" vacancy in Cook County's First Judicial Subcircuit, leaving Bonita Coleman-John as the one and only candidate left for that vacancy. 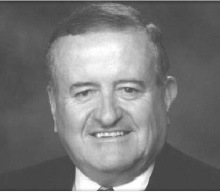 There being no Republican or Green opposition, Coleman-John will be elected to that post and take office in December 2010. Five Democratic candidates filed for the countywide McCarthy vacancy in the special filing period that closed November 23. Each of the five candidates, including the party-slated candidate, Assistant Public Defender Daniel J. Gallagher, drew objections to their nominating petitions. The objections against Gallagher's papers were withdrawn. Jessica A. O'Brien, James P. Piezonka and Brad Trowbridge all withdrew their candidacies on Tuesday, according to the State Board of Elections website. The only other candidate, besides Gallagher, Paul Martin McMahon, was removed from the ballot this morning. Gallagher may be unopposed in the primary, but he will have the distinction of being the only Democratic candidate for judge in Cook County to have to face a Republican in November: Maureen Masterson Pulia and Michaela Nolan Ryan both filed as Republicans in this race. I'd seen references to eVoter.com in various places as I've browsed about the web; tonight I set out to figure out what it was all about. Here's the deal: It provides a list of candidates. Right now, if you click over and check, you'll find a list of all candidates in all primaries. But a voter can narrow the search by providing eVoter.com with his or her home address; the site will supposedly provide a list then of only those races that will be on that voter's ballot. eVoter is an unbiased, non-partisan, website where people can enter their address and to see their ballot in the next election. 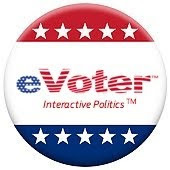 Voters use eVoter because they want to learn about Candidates and make informed choices. What kinds of things can voters do on eVoter.com? They can not only see which Candidates are running for which offices, they can also see which Organizations have endorsed which Candidates. Voters can filter their ballot by endorsements, make their selections and then print out their ballot to take to the polls on Election Day. Voters can also print out absentee ballot request forms and use eVoter to help make decisions when voting at home. Most importantly, Voters can interact with Candidates by supporting them, sharing Candidate Profiles and contributing. How does eVoter decide which Candidates appear on the site? All Candidates for office will be listed on eVoter after the date that the ballot is officially published by the relevant election authority. But only Candidates who create an eVoter Candidate Profile will have an interactive listing. Prior to this date, only Candidates who create an eVoter Candidate Profile will appear on our Sample Ballot. Therefore, we do not decide which Candidates appear on eVoter. As a Candidate, what can I do with my Profile? On your Profile you will be able to post pictures, your statements and information, your endorsements, and links to your website, Facebook profile, YouTube videos, and press articles. Voters will be able to contact you to support your campaign and you will be able to contact them back. You can even receive donations through your eVoter profile. What’s the cost to a Candidate to have a Profile on eVoter.com? The cost of an eVoter Profile is on a sliding scale based on the size of the office you are running for. Click here to see our Price List (www.evoter.com/candidate/pricing) and Terms and Conditions www.evoter.com/terms. At any level, the cost of an eVoter Profile is a tiny fraction of the cost of normal political advertising in any other medium. Most importantly, you will be reaching Voters who are visiting eVoter because they are looking to make an informed decision. What’s the cost to a Voter to use eVoter? Voters can use all of eVoter’s functionality for free. Voters never pay for any of our services, including: Generating a personalized Sample Ballot, viewing Candidate Profiles, sending support messages to Candidates and seeing Organizational endorsements. What’s required for a Candidate to create a profile? Can a Voter make contributions to a Candidate using eVoter? Yes, people can make contributions to a Candidate’s campaign using through a Candidate’s Profile page, using our affiliated payment processor. We also provide the Candidate with detailed reports of contributions, including the information necessary to assist in complying with State and Federal election laws and regulations. According to the eVoter.com price list, judicial candidates can create their own profile for $100. Profiles in other races cost as much or more. As of tonight, I could find only one Cook County judicial candidate, Russell William Hartigan, a candidate for the countywide Riley vacancy, that's created an eVoter.com profile. I would guess there'll be more. It's interesting that the eVoter site allows a candidate to receive campaign contributions. Found on the Internet, the campaign website of Maureen Masterson Pulia, Republican candidate for the countywide McCarthy vacancy. That's a link to the site in the preceding sentence; a link has also been added to the Sidebar. The Lawyers Committee to Elect Dennis Michael Fleming will host a fundraiser at Fado Irish Bar, 100 W. Grand in Chicago, on December 22 from 5:00 to 7:00pm. 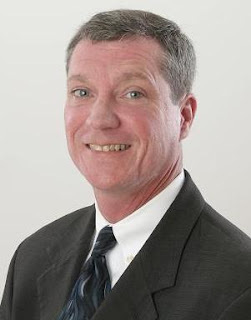 Fleming is a candidate for the Otaka vacancy in Cook County's 9th Judicial Subcircuit. Tickets are available for a "suggested minimum contribution" of $125, but "governmental lawyers" will be admitted for $75. Per email received from Avy Meyers, the host and moderator of North Town News Magazine, some new judicial candidate interviews are now available on line and on Page Two of this blog. Specifically, you can see Meyers' interview of either Diann K. Marsalek or Edmund Paul Michalowski by following the links in this sentence. As a bonus, although races for the Appellate Court are slightly beyond the scope of this blog, Meyers has also allowed us to post his interview of Chancery Judge James R. Epstein and you can find that on Page Two as well. Click to enlarge the flyer for more information about NTNM including when and where the show can be seen. You can't 'Facebook friend' Florida judges... what about Illinois? You may have heard or read last week that a Florida ethics committee ruled that judges cannot "friend" lawyers on Facebook or other social networking sites. The way the story was reported, you might be forgiven for concluding that a bunch of moss-backed old Luddites in Tallahassee are fighting some sort of last-ditch resistance against that crazy Internet thing all those durn-fool kids keep talking about. The New York Times' December 10 take on the story was not quite that harsh; neither was the Wall Street Journal's "Law Blog" December 9 post. And the actual facts are more nuanced still. That's a link to the actual November 17 opinion of the Judicial Ethics Advisory Commission of the Florida Supreme Court in the preceding sentence. The press coverage focused on just one aspect of the Florida opinion, namely, whether Florida judges should accept 'friend' requests on Facebook and other social networks from lawyers likely to appear in their courts. Florida said this was a bad idea because "listing lawyers who may appear before the judge as 'friends' on a judge's social networking page reasonably conveys to others the impression that these lawyer 'friends' are in a special position to influence the judge. This is not to say, of course, that simply because a lawyer is listed as a 'friend' on a social networking site or because a lawyer is a friend of the judge, as the term friend is used in its traditional sense, means that this lawyer is, in fact, in a special position to influence the judge. 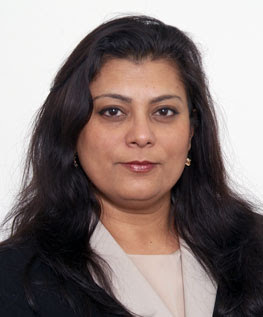 The issue, however, is not whether the lawyer actually is in a position to influence the judge, but instead whether the proposed conduct, the identification of the lawyer as a 'friend' on the social networking site, conveys the impression that the lawyer is in a position to influence the judge. 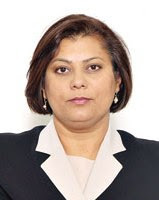 The Committee concludes that such identification in a public forum of a lawyer who may appear before the judge does convey this impression and therefore is not permitted." Second, the Illinois Supreme Court has its own Twitter feed. As a practical matter, therefore, it appears that the Illinois courts have taken a different approach to social networks than their Florida brothers and sisters. And even the Florida JEAC did not forbid Facebook to Florida jurists altogether. Judges may establish sites and 'friend' each other -- and, presumably, their families and non-lawyer neighbors and friends as well. Also, said the Florida Committee, judicial campaign committees can set up Facebook pages where lawyers, even lawyers who appear before that judge, can list themselves as "fans." The key distinction, in the opinion of the Florida JEAC, is that, on a fan page the lawyer is not accepted or rejected by the judge. "Because the judge or the campaign cannot accept or reject the listing of the fan on the campaign's social networking site, the listing of a lawyer's name does not convey the impression that the lawyer is in a special position to influence the judge." * Indeed, a minority of the Florida Committee reached this conclusion also. Quoting from the report, "The minority concludes that social networking sites have become so ubiquitous that the term 'friend' on these pages does not convey the same meaning that it did in the pre-internet age; that today, the term 'friend' on social networking sites merely conveys the message that a person so identified is a contact or acquaintance; and that such an identification does not convey that a person is a 'friend' in the traditional sense, i.e., a person attached to another person by feelings of affection or personal regard." According to the Illinois State Board of Elections website, Scott Edward Lipinski was removed yesterday from the ballot, ending his quest to replace his mother, the Hon. 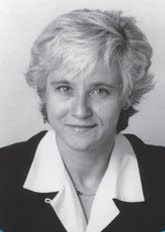 Marcella C. Lipinski, in Cook County's 15th Judicial Subcircuit. A crowded field remains in that race including Linzey D. Jones, Frank James Ryan, Pat Flanagan, Nicholas W. Karas, Richard G. Karwaczka, Karla Marie Fiaoni, Michael Brendan Barrett, and Associate Judge Joan Marie G. Kubalanza. William D. Moore's bid for the 15th Subcircuit Phelan vacancy was also presumably ended yesterday when he was removed from the ballot. Remaining in the race for the Phelan vacancy are Judge John C. Griffin (appointed to this vacancy by the Illinois Supreme Court); Carl Evans, Jr.; Nichole C. Patton; Thomas "TJ" Somer; and Mary Beth Kent Duffy. According to the Illinois State Board of Elections, Melanie Rose Nuby has withdrawn from the race to replace Cook County Circuit Judge James P. O'Malley. 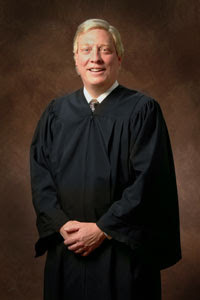 This leaves Judge Thomas V. Lyons, who was appointed to this vacancy by the Illinois Supreme Court in August 2008, as the only remaining candidate for that vacancy in the February 2, 2010 Democratic primary. Since there are no Republican or Green Party candidates for this vacancy, Judge Lyons no longer faces any electoral obstacle to keeping his job. Before going on the bench, Lyons practiced with the Nolan Law Group. He joined that office in 2005 after nearly two decades with the Cook County State's Attorney's Office, where he had served as deputy chief of the civil actions bureau and chief of the Special Litigation Division. Prior to that, according to a December 27, 2005 Chicago Daily Law Bulletin article, Lyons was a top prosecutor in the Felony Trial Division. Per email received, a fundraiser will be held December 15 for Judge Steven J. Fruth, appointed by the Supreme Court to the Riley vacancy in Cook County's 11th Judicial Subcircuit. The fundraiser will be held at Rosebud Theater District, in the lobby of 70 West Madison Street, from 5:30 to 7:30pm on the 15th. Individual tickets are $100. "Friend" tickets are available for $250 and "host" tickets may be had for $500. In a nice nod to the holiday season, the organizers also ask that attendees consider bringing a "canned good" to benefit the Greater Chicago Food Depository. For additional information or to make reservations, email Matt Fruth at mattfruth+rose@gmail.com or call (708) 606-4164. Cook County Clerk David Orr's website has regularly updated information about challenges to any and all Cook County candidates -- including judicial candidates. Scroll down for judicial candidate information. Found on the Internet, the campaign website of David J. Coleman, candidate for the Darcy vacancy in Cook County's Third Judicial Subcircuit. That's a link to the site in the preceding sentence; a link has also been added to the Sidebar. The Chicago Tribune website has this AP story today about holiday light recycling. The City of Wheaton and several Cook County municipalities will be collecting old holiday lights at various times between now and the end of the January. Hopefully these collection sites will be in better shape than the City of Chicago facility I visited this evening. I had some cardboard and plastic to drop off at the recycling bins in the Caldwell Woods Forest Preserve, 6358 W. Devon. But when I got there, not only were the blue dumpsters full to overflowing, a volume of recyclables as large as the dumpsters themselves was piled up against them. It's my understanding that the City gets cash for this green trash. (They'd better; everyone else gets money for their recycling.) Considering the sorry state of the City budget, one might think that a revenue opportunity like this would not be so neglected. I've been to this collection facility before and I've never seen it in such bad shape. Readers: Are you having similar experiences... or was this just a one-time unhappy event? Found on the Internet: The campaign website of Marvin W. Gray, a candidate for the countywide Riley vacancy. That's a link to the site in the preceding sentence; a link has also been added to the Sidebar. I'm usually grateful for comments -- but not always. NOT ETHICAL,NOR PRACTICES INTEGRITY OR MORAL TURPETUDE IN HIS DEALINGS WITH THE PUBLIC AND EMPLOYEES. ITS UNFORTUNATE BECAUSE WE NEED FAIR IMPARTIAL JUDGES! Don't bother looking for the original because I've taken it down. I don't want to become an accessory to drive-by character assassinations. Please note: I am not assuming responsibility for any content or comments here except that which I put up. I will do my best to police this site, but this is a spare-time activity for me and I may miss something. Some objections to candidate nominating petitions are still unresolved, so some of these may change, but the Cook County Clerk's Office has issued this candidate list that shows ballot numbers as they stand right now. Found on the Internet: The campaign website of Associate Judge Joan Marie G. Kubalanza, a candidate for the Lipinski vacancy in Cook County's 15th Judicial Subcircuit. That's a link to the website in the preceding sentence; a link has also been added to the Sidebar. This is an updated, corrected version of a post first put up on Tuesday evening. Objections have been filed to the nominating petitions of each of the five Democrats who filed for the countywide McCarthy vacancy in the recently concluded special filing period. 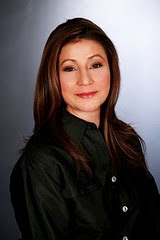 Elizabeth Granoff is the objector against James P. Piezonka and Brad Trowbridge; Margaret M. Johnson and Susana Y.Accove are the objectors against Jessica A. O'Brien; and Kent Sinson is the objector against Paul Martin McMahon. Jessica A. O'Brien and Paul Martin McMahon have each filed objections to Daniel J. Gallagher's nominating petitions. The petitions filed by the two Republicans in the race, Maureen Masterson Pulia and Michaela Nolan Ryan, were not challenged. A happy consequence of browsing through the countywide judicial candidates' responses to the Tribune questionnaire was the discovery of two more campaign websites. I found this evening that Sandra G. Ramos has a campaign website. That's a link in the preceding sentence; a link has been added to the Sidebar. Ramos is a candidate for the Riley vacancy. I also found a campaign website for James Michael Bailey. That's a link to the site in the preceding sentence; a link for his site has been added to the website as well. Bailey is also a candidate for the Riley vacancy. I also saw that several other countywide candidates have sites under construction. The Sidebar will continue to grow... soon. Herewith links to the candidate questionnaire responses posted by the Chicago Tribune. In this post we will look at candidates for the eight countywide vacancies in Cook County. If a candidate's name is not linked, it means that the candidate, as of this writing, has not yet responded to the Tribune. Please note: Each of the persons listed on this page -- indeed, nearly every single Cook County judicial candidate is a candidate in the Democratic primary. There are two exceptions -- two Republicans are battling for the right to oppose the successful Democratic candidate for the McCarthy vacancy. However, neither Maureen Masterson Pulia nor Michaela Nolan Ryan has yet responded to the Tribune questionnaire. * This is the only Cook County judicial race -- countywide or subcircuit -- in which any Republican has filed. Neither of them are listed here. See explanatory note at the outset of this post. The Tribune lists candidates alphabetically; they're listed here in ballot order. Herewith links to the candidate questionnaire responses posted by the Chicago Tribune. In this post we will look at candidates for the two vacancies in Cook County's 9th Judicial Subcircuit. Every candidate in these to races has already responded to the Tribune questionnaire. Actually, paging through the Tribune questionnaires, it appears that there are several 15th Subcircuit candidate sites "under construction" so the Sidebar list will grow more soon. But the campaign website of Pat Flanagan appears up and running right now. Thus the link in the preceding sentence and its addition to the Sidebar. Herewith links to the candidate questionnaire responses posted by the Chicago Tribune. In this post we will look at candidates for the three vacancies in Cook County's 15th Judicial Subcircuit. If a candidate's name is not linked, it means that the candidate, as of this writing, has not yet responded to the Tribune. Yes, I know we're talking about the Tribune endorsement questionnaires this evening, but this regular column title from the late Sydney J. Harris of the old Chicago Daily News occurred to me as I was looking through the candidate responses on the Tribune site. I found two new websites while looking up the Third Subcircuit candidate questionnaire responses. I found this campaign website for Steven G. Watkins. That's a link to the site in the preceding sentence; a link has also been added to the Sidebar. I'd already found a campaign website for Charles Francis Fitzgerald. But tonight I found that he has two. You can choose between www.fitzforjudge.net or www.fitzgeraldforjudge.com. I had the former site; the Tribune had the latter. The sites appear identical -- but the Tribune site name seems more formal. Herewith links to the candidate questionnaire responses posted by the Chicago Tribune. In this post we will look at candidates for the three vacancies in Cook County's Third Judicial Subcircuit. If a candidate's name is not linked, it means that the candidate, as of this writing, has not yet responded to the Tribune. Herewith links to the candidate questionnaire responses posted by the Chicago Tribune. In this post we will look at candidates for the three vacancies in Cook County's First Judicial Subcircuit. If a candidate's name is not linked, it means that the candidate, as of this writing, has not yet responded to the Tribune. Herewith links to the candidate questionnaire responses posted by the Chicago Tribune. In this post we will look at candidates for the Barbara Riley vacancy in Cook County's 11th Subcircuit. If a candidate's name is not linked, it means that the candidate, as of this writing, has not yet responded to the Tribune. I saw an ad this morning on Facebook for a Cook County judicial candidate. I made a mental note to come back and save the ad for blogging purposes but, as it turns out, Facebook's rotation system hasn't brought that ad back. And I've clicked repeatedly this morning trying. I've talked here about candidates with Facebook pages -- and judicial campaigns with public Facebook pages -- but this was the first paid advertisement I'd seen. Readers: Have you seen ads for judicial candidates on Facebook? 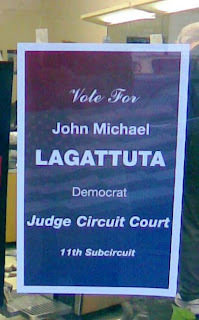 Have you seen ads for Cook County judicial candidates cropping up in places you did not expect to find them? Leave a comment. The Chicago Tribune has published a list of responses to endorsement questionnaires by judicial candidates. The link will take you to a page that lists all area judicial races (not just Cook County). Not all candidates have yet responded, but you can follow live links on that page to the responses submitted by each candidate who has responded. I have been highly critical of the Tribune's coverage (or, rather, lack thereof) of Cook County Circuit Court races in the past. I therefore find myself in a pleasant state of shock at this discovery. I will post more about these questionnaires soon. Found on the Internet: A campaign website for Russell W. Hartigan, candidate for the countywide Riley vacancy. That's a link to Hartigan's website in the preceding sentence. A link has also been added to the Sidebar. According to its blog, the 49th Ward organization will hold an endorsement session December 12 -- but not for judicial candidates. The linked post states, "If you are running for a County-wide judicial vacancy or an Appellate Court vacancy we will continue to do our endorsements by a panel of our membership. You can send your resume, bar ratings which must include a favorable review from either the Chicago Bar Association or the Chicago Council of Lawyers, and any additional information you would like to submit. There will not be an endorsement session for Appelate or County-wide judicial candidates." For additional information, follow the link. Other groups make endorsements -- but don't necessarily invite candidates to seek them. Groups should be free to endorse whom they will and how they will -- but if only one candidate is 'invited' to present his or her credentials and receive an endorsement, doesn't that reflect on the credibility of the endorsement? Of course, some groups may be contacting candidates directly, conducting an open process, but in private. There's nothing wrong with that. If you, dear reader, knows of any group holding an endorsement session for Cook County judicial candidates, and if you'd like to get the word out about it, please leave a comment or send me an email.